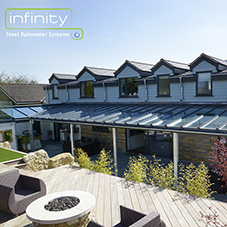 Alumasc Wade HCE drainage channels and access covers were installed to provide water management, and a bespoke hybrid roofing system installed using Hydrotech and Derbigum waterproof roofing. The entire project encompassed the construction of the Sainsbury Gallery, a flexible 1100m2 temporary exhibition space, the Blavatnik Hall, a new entrance into the V&A from Exhibition Road, the Aston Webb Screen, an updated colonnade formed from the original 1909 structure, and the Sackler Courtyard. Alumasc WMS devised a water management solution that would be able to accommodate the shape of the Sackler Courtyard, hugging the curved exterior wall of the café, and provide access covers that would seamlessly blend with the 11,000 unique, parallelogram shaped porcelain floor tiles. A custom designed Wade HCE stainless steel drainage channel was fitted for the exterior wall of the Sackler Courtyard Café. 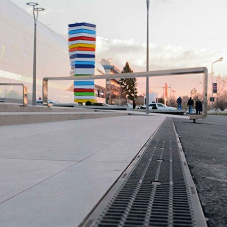 This provides a discreet direct water flow into a below surface linear drainage system, designed to accommodate large water volumes and withstand heavy foot traffic above. Ideally suited for draining large areas finished with block paving, this channel can be designed to accommodate a range of paving thicknesses (min. 15mm) and flow rate requirements. Waterproofing and insulation was also updated for the roofing system. A hybrid system between Hydrotech and Derbigum was installed on the podium and the main roof areas. Hydrotech is a hot-melt rubber bitumen membrane which is heated and combined with a polyester reinforcement and protection sheet to form a weatherproof layer. It has a 100% bond to prepared concrete surfaces. “The entire project is a great example of AWMS and Alumasc Roofing Systems’ ‘complete building envelope’ approach to water management,” Brian Connington, Area Manager for Alumasc Roofing, concluded. 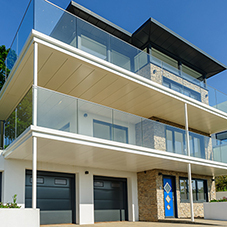 “Alumasc offer a single source, complete roofing and drainage solution from rain to drain, and by specifying Alumasc products across the spectrum, we were able to gain a full picture of the project and really understand its goals".